All spiders have 8 legs, 2 body parts (cephalothorax and abdomen), fang-like "chelicerae," and antenna-like "pedipalps." Click on the terms below to learn more about each body part. The cephalothorax is the first of 2 body parts on a spider. It is a combination of the head and thorax, and on it are found the legs, eyes, pedipalps, chelicerae, and other mouthparts. The cephalothorax and abdomen are connected by a thin stalk called the "pedicel." Among arachnids that live in Kentucky (including scorpions, daddy-long-legs, and mites) only spiders have this thin stalk between the abdomen and cephalothorax. Some arachnids that do not live in Kentucky, such as Tailless Whipscorpions, also have a thin connection between the 2 body parts, and these creatures can be difficult to distinguish from spiders. Like the chelicerae, a spider's pedipalps are part of its mouth, and are located just between the chelicerae and first pair of legs on the cephalothorax. Pedipalps are jointed, and look somewhat like small legs. They are not used like legs, though. Instead, they are more like antennae: pedipalps help the spider sense objects that it encounters. Some spiders also use their pedipalps to shape their webs and to aid in prey capture and feeding. Pedipalps are used by male spiders to transfer sperm to female spiders. In fact, you can usually distinguish a male spider from a female because of the male's enlarged pedipalps. All arachnids have pedipalps, but they often look quite different than spider pedipalps. In Scorpions, for instance, the large pincers are actually modified pedipalps. A spider's eyes are located on the cephalothorax. Most spiders have 6 or 8 eyes. Spider eyes are considered "simple": they do not have multiple lenses and facets as do the compound eyes found on some insects. Although some spiders can only see the difference between light and shadow, others, especially Jumping Spiders, are believed to have excellent eyesight. Like all arachnids, spiders have 8 legs, all of which are attached to the cephalothorax. Each leg is made up of 7 segments (shown above). 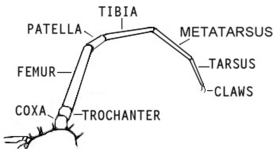 Attached to the cephalothorax is the coxa, followed by the trochanter, femur, patella, tibia, metatarsus, and tarsus. The tarsus is tipped with 2 or 3 claws, depending on the spider family. The spider's abdomen contains many important internal organs, such as the digestive tract, reproductive organs, and lungs. Tipping the abdomen are the spinnerets. A spider produces silk through tiny pores in its spinnerets. Most spiders have 6 spinnerets.